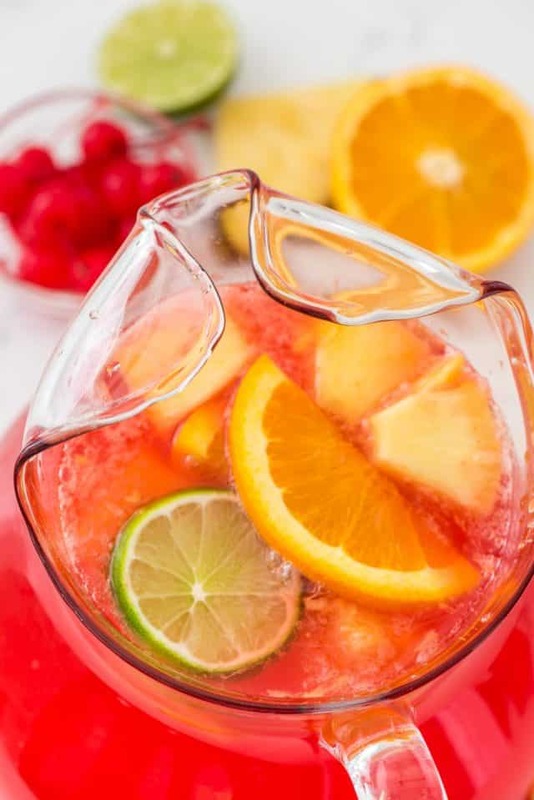 Fruity Vodka Party Punch is the perfect cocktail recipe for a party! 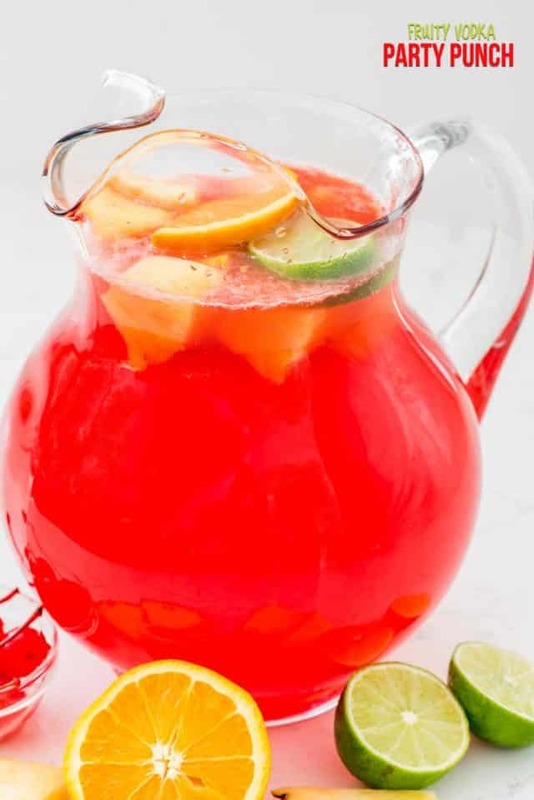 This drink is full of lemonade and fruit punch, rum, and vodka and is the perfect easy punch recipe. There’s just something about a red fruit punch drink that makes me think tropical or fun…and it makes every party just that much better. I don’t know about you guys but when there is a party I always head for the punch. There’s something almost wistful about a bright red fun and fruity punch recipe, isn’t there? I just love all the flavors. When I was a kid I used to equate fruit punch with actual fruit, and I got plenty of servings every day. Somehow I don’t think fruit punch is what the surgeon general was thinking when he said we should eat 4 fruits a day, but I did it anyway. As an adult I like my punch with a little kick, if you get my drift. It’s even better if the punch tastes like fruit and sweetness and not like vodka…although that’s not always better. It feels better in the moment but most certainly not the next day! Are you doing anything for the Super Bowl this weekend? I will be hoping a few of my friends come over and help me hide in the living room. Mel will be in the family room where no one will be allowed to move or talk. He *might* let us in there for halftime, but no promises. 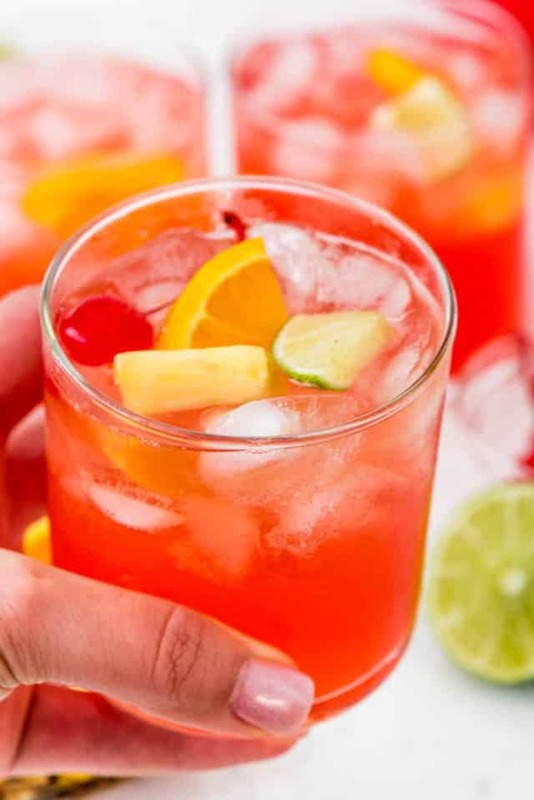 Even if you’re not celebrating the last football game of the season, this Fruity Vodka Party Punch is the perfect cocktail punch recipe for any party. I can see serving this at baby and bridal showers, the 4th of July, and any spring or summer gather where you want a drink recipe that will serve a lot of people. This recipe is an easy party in your glass, made with vodka and rum. I used fruit punch and lemonade as the juice and club soda, to give it fizz. You could also make this punch with Sprite or Diet 7Up if you want, or even Ginger Ale. I love doing it with club soda because then there is no added sweetness. (La Croix is a good substitute, like I did in my Strawberry Lime Punch recipe.) As I get older I don’t like super sweet drinks as much, so I tend to add sparkling water instead of sugary or diet soda. 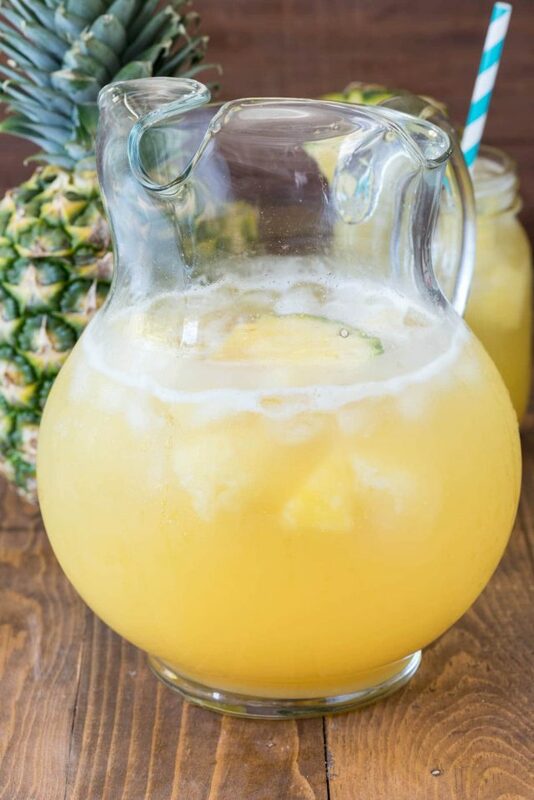 Adding fruit to the pitcher is a nice touch for garnish, although if you’re serving this in a punchbowl you could definitely add sherbet for a traditional punch recipe. The bright red color of this punch is so festive, it’s perfect for any occasion! 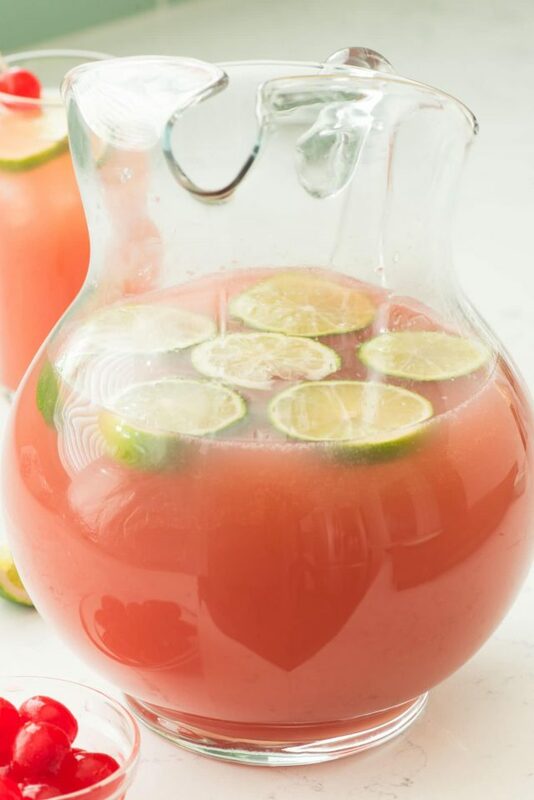 Fruity Vodka Party Punch is the perfect cocktail recipe for any party, filled with fruit punch, lemon, vodka, and rum! Now, as I always say in cocktail recipes, taste is subjective, and so is strength. I’ve had people tell me that my Cake By The Ocean Cocktail was both too weak and strong enough to get them drunk after one serving. If you taste this and it’s too strong, add more club soda. If it’s not strong enough, add more vodka or rum. That’s what I love about drink recipes; you really can easily change them up to suit your preferences. This would also be good with tequila, like my Raspberry Lemonade Margaritas, but ever since a mishap at a Friendsgiving Party a few years back I try to avoid tequila at all costs, lol. If this drink looks familiar, it could be because it’s kind of a cross between Jungle Juice punch (which has orange juice instead of lemonade) and my Maui Island Breeze Cocktail. There’s just something about all the flavors in the fruit punch and lemonade that make me want more and more…and more. 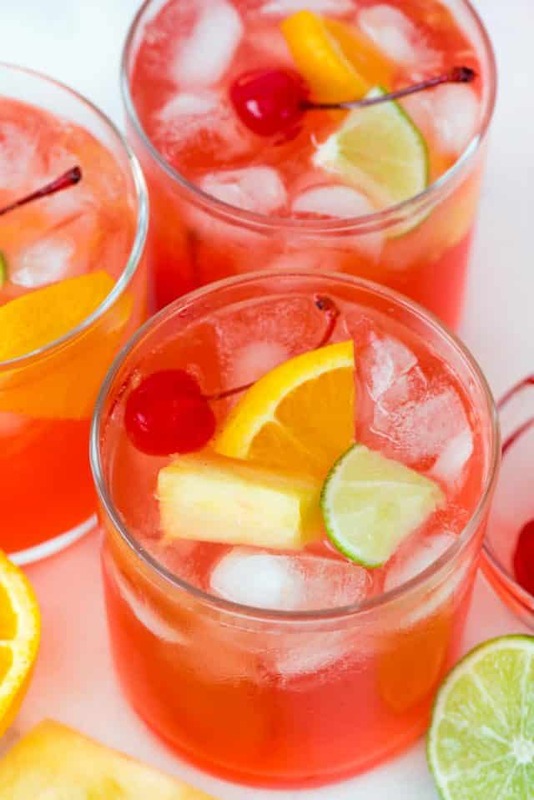 Vodka Fruit Punch mixed with rum and lemonade…yes please and thank you very much! You’ll notice that my recipe only calls for using half of each the fruit punch concentrate and lemonade concentrate. That’s because my pitcher isn’t big enough to do a full batch, which would serve a LOT of people. However, you can make a larger batch by just doubling the recipe, easily. OR, use the other half the concentrates to make a non-alcoholic version of this party punch. Just add Sprite and club soda in place of the vodka and rum. Tip to keep your drinks cold: use frozen fruit instead of fresh. It acts like ice! Making vodka fruit punch like this is actually cheaper than buying big cartons of lemonade and fruit punch, but you can do that as well. I’ve made a note in the recipe, but add 4 cups each lemonade and fruit punch, then add the alcohol and top off with club soda as desired. See? Cocktail and punch recipes are SO easy to make and modify to your liking! Just drink it slow…with a lot of party food! Be sure to check out all my other Vodka Party Punch recipes! I have Orange Vodka Party Punch, Vodka Limeade Punch, Cranberry Champagne Punch with vodka, Strawberry Lime Party Punch, Seabreeze Cocktail Punch, Salty Dog Punch with grapefruit, and Pineapple Party Punch with champagne! Stir all ingredients in a pitcher. Add fruit for garnish (sliced oranges, limes, pineapple, and cherries). Note that cocktail recipes are somewhat to taste. Want this stronger? Add more vodka. Want it less sweet? Add more soda. Ah! I can just picture the sunshine, a picnic, and a lovely glass of this fruity punch. It’s getting me excited for warmer weather. My signature summer drink is a blue margarita. This is right up my alley! I will be on a beach on Sunday and definitely not watching the game but this drink in my hand would be so refreshing! 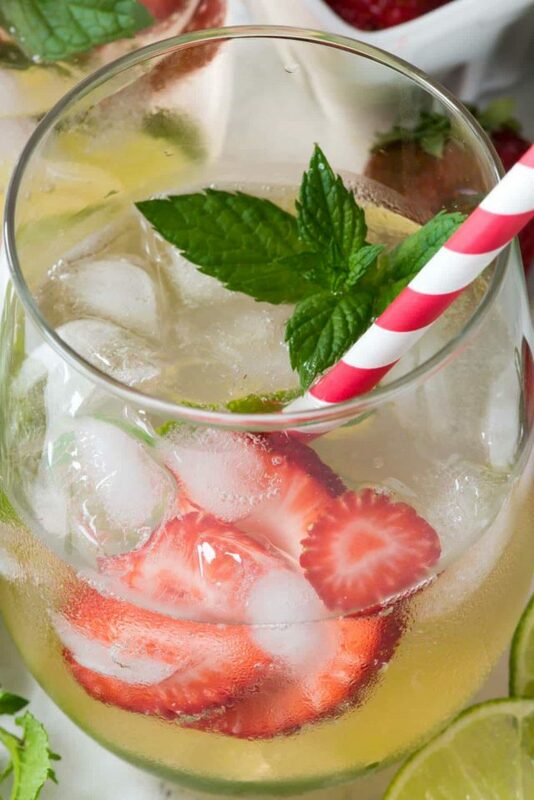 looking for some party punches and found this on your front page, looks wonderful, love the club soda that’s not usually in this kind of punch (at least not to me!) so a nice “upgrade” to the original and great tip too about using frozen fruit to keep it cold, it also won’t dilute the flavor like ice will, thank you! Looks so good must try it now for the festive season. Please send me for kids and also for grown ups.